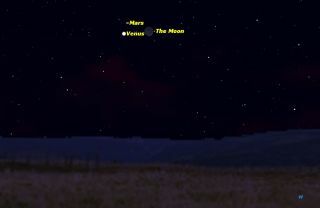 Just after sunset on Friday (Feb. 20) evening there will be a close grouping of the moon and the planets Venus and Mars. Mars, Venus and the moon will meet up in a particularly beautiful cosmic display Friday (Feb. 20). If you've been watching the evening twilight sky over the past few weeks, you will have seen the brilliant planet Venus gradually moving away from the sun, setting slightly later every evening. At the same time, the planet Mars has been gradually moving downward toward the sun, setting slightly earlier every evening. The two planets will pass close to each other on Saturday (Feb. 21), but that close encounter will happen in the daylight sky, shielding the meeting from view. The best time to see the two bodies will be the evening before, on Friday. Currently, both Venus and Mars are on the far side of the sun, so their disks are both very small. Venus is only 12 arc seconds in diameter, and Mars is even smaller, at less than 5 arc seconds. These planets are comparable in size to very small craters on the moon. The lunar surface should be partially lit up by earthlight, sunlight reflected off the planet Earth. Close groupings like these are wonderful subjects for photography. Zoom your lens to maximum magnification, and try to frame the cosmic bodies with interesting foreground objects. If your camera has automatic exposure, your pictures may come out overexposed, so you may want reduce the exposure to get a more pleasing result. The solar system is like a giant clock, with the objects orbiting each other in precise time like the clock's hands. The movements of the moon and planets can be predicted accurately for thousands of years into the future. The answer is that this has never happened, not even once, in the 4-billion-year history of the solar system, and will never happen before the sun swells to a red giant more than 4 billion years hence.